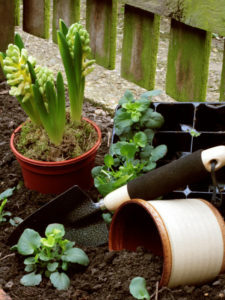 It’s that time again – spring has decided to stick around and you have the urge to clean up and clean out your space. Don’t forget to give some time and attention to cleaning up your outdoor living spaces. If you don’t do it now, you’ll have to do it later when it will be more difficult. There are many benefits of tidying up your lawn and mulch beds now, but the biggest one is that it frees you up to enjoy your yard when you want to — the summer. Below are some helpful spring cleaning tips that are easy to perform, if done as soon as possible. So, be prepared to spend the next sunny Saturday afternoon cleaning out your yard so you can enjoy the beautiful days ahead. Your yard goes bald too, except bringing back lushes growth is a lot easier for the lawn than for your hair! The springtime is perfect for patching up those brown, neglected spots. The ground is soft enough to work with from all of the rain, and grass seeds will get a good start. Rain is a beautiful thing. Take a look at your lawn and pinpoint the weak spots. Rake the dead grass out and reseed them before the hot, dry season sets in. With a little advanced care, your lawn won’t be an eyesores during your family barbecues. Pruning is confusing. Cut before new growth starts? After a shrub blooms? Cut the shrub to the ground? We understand why pruning isn’t everyone’s favorite job — and it can be tedious. But think about the long-term effects of giving your shrubs some simple TLC. Spring has ample amounts of sunlight and rain and if you learn the correct timing for pruning, your plants will be able to allocate these precious resources and become lush and beautiful. It’s okay, as long as you pick up the slack now. The leftovers can really damage a yard. Matted leaves block the rain and nutrients from getting to your lawn and flower beds. Spend an hour on a nice evening and look for leaves, sticks, rocks, and anything that is a bit out of place. You’ll appreciate the results. Kissel Landscaping is always available to help with your landscaping needs. If you want help with your spring clean-up or any project, give us a call!